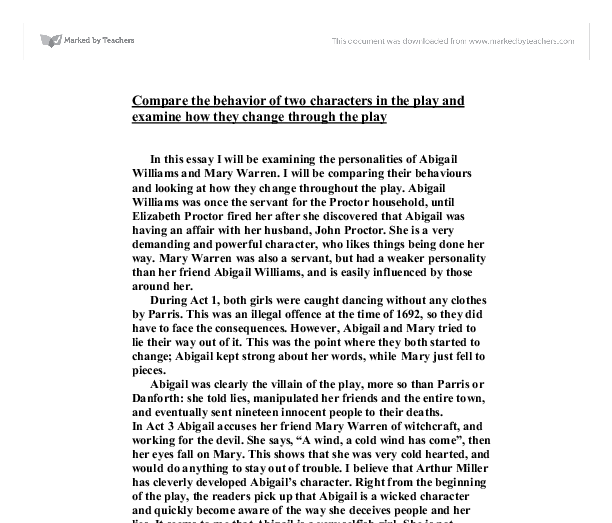 Compare the behavior of two characters in the play and examine how they change through the play In this essay I will be examining the personalities of Abigail Williams and Mary Warren. I will be comparing their behaviours and looking at how they change throughout the play. 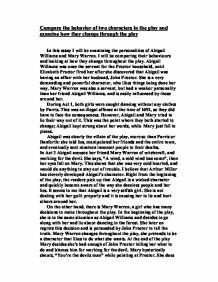 Abigail Williams was once the servant for the Proctor household, until Elizabeth Proctor fired her after she discovered that Abigail was having an affair with her husband, John Proctor. She is a very demanding and powerful character, who likes things being done her way. Mary Warren was also a servant, but had a weaker personality than her friend Abigail Williams, and is easily influenced by those around her. During Act 1, both girls were caught dancing without any clothes by Parris. This was an illegal offence at the time of 1692, so they did have to face the consequences. ...read more. It seems to me that Abigail is a very selfish girl. She is not dealing with her guilt properly and it is causing her to lie and hurt others around her. On the other hand, there is Mary Warren, a girl who has many decisions to make throughout the play. In the beginning of the play, she is in the same situation as Abigail Williams and decides to go along with her and lie about dancing in the forest. She later on regrets this decision and is persuaded by John Proctor to tell the truth. Mary Warren changes throughout the play, she pretends to be a character that likes to do what she wants. At the end of the play Mary decides she's had enough of John Proctor telling her what to do and blames him for working for the devil. ...read more. Whenever Mary was questioned, she always seemed to take a while to reply and it almost looked as if all the words coming out of her mouth were lies. Whereas when Abigail was questioned, she usually answered straight away. I believe the judges realised this, which was why they always believed Abigail. In conclusion, I thought that both characters had vital roles in the play. In the beginning, Abigail was a very confident person and had a lot of self-esteem. However this did seem to change towards the end of the play as she ran away from the town, this shows me that she acted very selfishly. Arthur Miller tried to portray Abigail's character as a villain and I believe that it worked well. Mary Warren was shown to be an innocent person in the play, although towards the end she did stand up for herself. In my opinion, Miller wanted the readers to think that Mary was kind of a hopeless character that develops to a stronger character throughout the play. Harveer Gill 10BZ ...read more. A "knowing smile" usually suggests a secret, but this is not a small secret kept between friends, it is such a secret that can ruin a man's reputation forever; a secret shared by lovers. Even though Proctor knows that communicating with Abigail could seriously jeopardise his marriage, he still cannot resist smiling when he sees her. Elizabeth's character is driven by the truth because even when John decided that he will not lie to save himself, she supported him even though she knew that she would lose her husband. She feels that if he must redeem himself in this way, she cannot take that away from him. Abigail requires a lot of attention during the play to divert the fact that she is the ringleader. She acts as though she is sorry for what she has done. We can see this in the quote, "I want to open myself," She says this when she wants forgiveness for the dancing. Examine how the character of Mary Warren changes throughout the play. This lets the audience/reader in on another, almost wicked, side to Mary. At this stage I think Mary Warren slowly starts to change, some how building up the courage to take the risk of trying to sway Proctors mood. She thinks she is, for the first time important. Proctor's reaction to the accusation of being "the Devil's man" is petrifying, a previously outspoken perhaps even courageous in his attempts to bring justice to the court and free his wife, is "stopped in his tracks" and he becomes "numbed" this illustrates the horror that Proctor faces and the horror that is being faced on stage. It didn't affect Proctor who probably recognised the deception. This scene showed Abigail's guileful ability when under pressure. She is flexible and can adapt to a changing situation so as to remain in control of things. She is cognitive and sharp.